FILE - A fighter of the Syrian Democratic Forces gestures in the village of Baghuz, Deir el-Zour province, Syria, March 18, 2019. A series of airstrikes late Thursday slammed into two pockets of Islamic State fighters trying to cling to the last scraps of land to be part of the terror group's self-declared caliphate. The strikes followed nearly two days of clearing operations in the northeastern Syrian town of Baghuz, where hundreds of IS fighters surrendered earlier this week to U.S.-backed Syrian Democratic Forces. A media official with the YPG, a Kurdish militia that has been supporting the SDF offensive, said some of the strikes targeted one group of IS fighters who had been pushed to the edge of the Euphrates River. The rest were aimed at a second group that had taken cover by a mountain on the outskirts of the town. But despite the bombardments, the U.S.-led coalition said late Thursday that IS was putting up a "hard fight." "Daesh is showing that they intend to keep fighting for as long as possible," the coalition said in a statement to VOA, using the Arabic acronym for the terror group. The coalition also accused IS of deliberately putting the remaining civilians in harm's way. "Daesh continues to resort to gruesome tactics like suicide attacks and using children as human shields," it said. Aid groups, like the International Rescue Committee, have called on the SDF and the coalition to minimize the danger to any women and children still in the IS-held areas. "Everything must be done to ensure that they are kept out of the line of fire," the IRC's Wendy Taeuber said in a statement early Thursday, noting that some of the thousands of women and children who evacuated Baghuz in recent days were now just arriving at the displaced persons camp in al-Hol. FILE - Smoke rises from the last besieged neighborhood in the village of Baghuz, Deir el-Zour province, Syria, March 18, 2019. Other groups, like the London-based Syrian Observatory for Human Rights, alleged Thursday that hundreds of civilians had been killed in an earlier round of airstrikes. The coalition said it was aware of the allegations and would investigate, but "we have seen no signs that the numbers being reported are true." Earlier Thursday, SDF fighters swept through the rubble in what was left of the IS enclave. Sources close to SDF leadership told VOA that almost all of the area above ground had been cleared, but that the U.S.-backed troops were searching for additional IS fighters who might still be lurking in trenches and in a complex system of caves and tunnels. The tunnels, which are thought to run for at least two kilometers, seemingly helped hide tens of thousands of people, mostly IS fighters and their families, through much of the early part of the SDF offensive. Officials said some of the tunnels were large enough to accommodate vehicles. And there were indications certain tunnels even might extend into neighboring Iraq. SDF officials said their advance had also been slowed at times by mines, as well as concerns that many areas would be booby-trapped. "Our forces are still conducting combing and search operations, and as soon as they are finished, we will announce the liberation," SDF spokesman Mustafa Bali said in a note to journalists. Fighters from the Syrian Democratic Forces hold walkie-talkies in the village of Baghuz, Deir el-Zour province, Syria, March 20, 2019. IS, though, remained defiant, releasing a new video Thursday showing scenes from inside Baghuz, while a fighter identifying himself as Abu al-Harith al-Ansari mocked U.S. efforts to destroy the terror group. "The banner has been elevated, and the Ummah, whose sons are racing to martyrdom, does not know defeat," al-Ansari said, according to a translation by the SITE Intelligence Group. "Those who are bewildered and think that our caliphate is over ... we will say that it's remaining and expanding, Allah willing, as long as it is on the right path," he added. Anticipation for a final declaration of victory has been building, especially in Washington, where President Donald Trump promised Wednesday that the IS caliphate would be "gone by tonight." But U.S. military officials have been wary of declaring victory too soon, pointing to numerous predictions over the past several months that all proved to be premature. 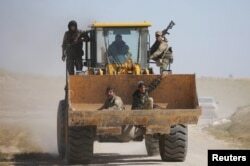 Fighters from the Syrian Democratic Forces sit in the bucket of an excavator in the village of Baghuz, Deir el-Zour province, Syria, March 20, 2019. "We will continue fighting with our partners and allies, hunting ISIS wherever they may be," Pentagon spokesman Charles Summers told reporters Thursday, using an acronym for the terror group. "The amount of territory they've held is smaller and smaller and smaller," he added. Thousands of SDF troops have massed around Baghuz for weeks, laying siege to the town in an effort to liberate the final IS enclave in Syria. Officials said Kurdish special forces from Iraq also had been brought in to help with the operations. Since then, SDF officials say, more than 5,000 IS fighters have surrendered or been captured, while another 1,300 have been killed. In all, upward of 30,000 civilians, mostly family members of IS fighters, have fled Baghuz since the offensive began, and 5,000 left in just the past week. Even once an official announcement is made, U.S. military officials cautioned that IS still had "tens of thousands" of fighters working either as part of sleeper cells or as part of an active, clandestine insurgency. Additionally, senior officials said they thought most of the group's senior leadership, including its self-declared caliph, Abu Bakr al-Baghdadi, remained at large. VOA Pentagon correspondent Carla Babb contributed to this report. Information from Reuters also was used in this report.